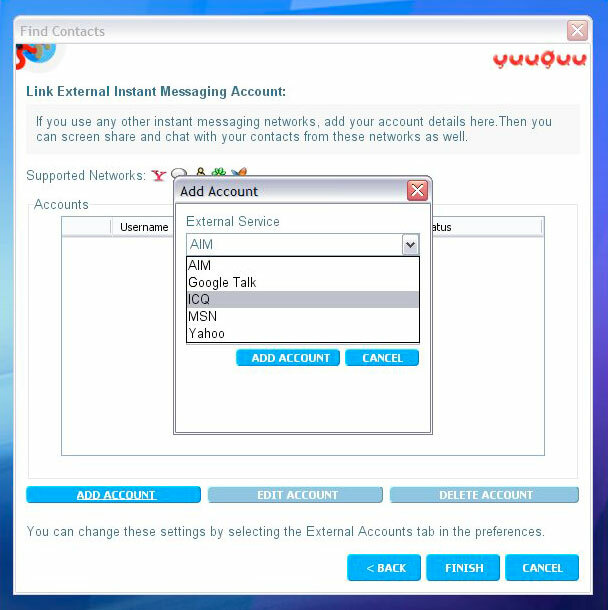 Yuuguu has integrated its remote desktop / screen-sharing collaboration service technology with instant messaging platforms MSN, Yahoo, AOL and ICQ in addition to its recent integration with Google Talk. Users are now enabled to share screens, hold web conferences and work collaboratively with anyone using any combination of these major IM platforms. The basic version of Yuuguu supports up to 30 people at one time, for free and without time limit. The service also supports group sessions across multiple IM platforms, so several participants on different networks can chat and join the secure conference or share screens. Users of other networks do not need to download the free Yuuguu client, only the web conferencing or screen sharing host needs to install it (works on PC, Mac and Linux). The rest of the group receives a standard web link that will allow them to view the host’s screen. The company, whose name means ‘fusion’ in Japanese, makes money from offering a phone conferencing service with a per-minute charge and also plans to introduce premium versions of its remote desktop service for release in 2009. Yuuguu faces some stiff competition: it is entering a field with well-established competitors such as Citrix’s GoToMeeting, Microsoft’s Live Meeting and Cisco’s WebEx, and will also compete against startups doing similar things, like Glance, BeamYourScreen and TeamViewer.